In our last two posts on this series we discussed how SWP from ICICI Prudential Balanced Fund and Reliance Regular Savings Fund Balanced option were proved to be good options if one was looking for regular returns by using the SWP method. Today we will analyze how the same worked for Birla Sun Life Balanced 95 Fund – Growth Plan. As you know already Balanced Mutual Funds invests 65 – 75 % of the portfolio in equities and rest in debt or money market instruments and also that the balanced funds are subject to equity taxation as these are hybrid equity oriented mutual funds. Long term capital gains, for investment period of more than 1 year and the dividends received from balanced funds - both are tax free. Short term capital gains applicable for investments of less than 1 year are taxed at 15%. Systematic Withdrawal Plan or SWP, as popularly known, is a service offered by Mutual Funds which provides investors withdrawal of a specific amount of payout at a pre determined time frequency, like weekly, fortnightly, monthly, quarterly, half-yearly or annually. Unfortunately, this is a much underestimated investment strategy in India. If understood properly, this could become the most effective and tax efficient way to earn regular returns from Mutual funds. Through a series of our articles on SWP, we will try educate the investors about SWP, how it works and the tax benefits etc. by showing some examples of top performing Balanced Funds. If you had invested र 10 Lacs in Birla Sun Life Balanced 95 Fund – Growth Plan on January 1, 2001 and withdrawn र 8,000 per month from January 2, 2002, then the current value of your investment would have been र 61.06 Lakhs even after withdrawing र 14.00 Lakhs! We presumed that the monthly SWP withdrawal of र 8,000 was started after one year (starting date January 2, 2002) from the date of investment (January 1, 2001) and thereafter on the 2nd day of every month so that each and every SWP amount in the hands of the investor is tax free. Please look at the image below to understand how we have selected the different options in the research tool to get this result. You can also explore this SWP Research tool to explore SWP return of any fund you like. From the above chart you can see that the investor would have withdrawn a total of र 14.00 Lakhs through 175 equal monthly SWP instalments of र 8,000 each, thus, he would have got a tax free return of 9.6% every year. Even after withdrawing a tax free amount of र 14.00 Lakhs, the current value of his investment would stand at र 61.06 Lakhs! The SWP returns were annualised (IRR) 17.07%. Inflation is a very vital point when you are planning your investments. In fact, two things are very important in any investment planning – Post tax return and inflation adjusted return - therefore, in this study, we will also analyse what happens when we increase the SWP amount by 5% every year (presuming average inflation rate of 5%). Please download the cash flow in excel and check how it worked? You will notice from the above image, how we have increased the SWP amount annually by 5% on the initial investment. You will also notice that during this entire period, the net investment value dropped to lesser than the initial lumpsum investment amount i.e. र 10.00 Lacs, only during the initial period of 20 months (January 2002 to August 2003). You must have also noticed that barring these 20 month, the remaining period the net investment value never gone down to less than the initial investment of र 10.00 Lacs even though we increased the SWP amount by 5% annually. It proves that if you remain invested over long period in balanced funds then the trailing returns should be positive. You will notice that during the last 15 years, the fund has beaten the VR-Hybrid Equity Index in most of the years excepting 2001 and 2008 only when the markets passed through volatile times. Birla Sun Life Balanced 95 Fund is a hybrid equity oriented fund, popularly known as balanced funds. Launched in February 1995, it is another popular fund in the Balanced Fund category from one of India’s top AMCs, Birla Sun Life Mutual Fund, having AUM of र 3,140 Crores (As on June 30, 2016). It is one of the best performing Balanced Funds in the industry with quite a long term track record of more than 20 years! Renowned fund manager Mahesh Patil manages this fund along Pranay Sinha. The top 5 stocks that the fund is invested in, are – HDFC Bank. Infosys, Maruti Suzuki and Tata Motors and ICICI Bank. The 3 top sectors are Energy, Financial and Automobile. So far we discussed the SWP returns of Birla Sun Life Balanced 95 Fund – Growth plan and found how amazing the results were. Let us now examine the lumpsum returns of this fund. Had you invested र 10 Lacs in this fund on January 01, 2001 then the current fund value would have been a decent र 1.21 Crores, a superb CAGR return of 17.41%. For this same period, if this amount was invested in fixed deposit, Gold and silver, then you would have got only र 28.39 Lakhs, र 64.61 Lakhs and र 46.65 Lakhs respectively. If you had done a SIP of same amount for the same period in CNX Nifty then the current value would have been only र 29.97 Lakhs with a return of 13.70% only. 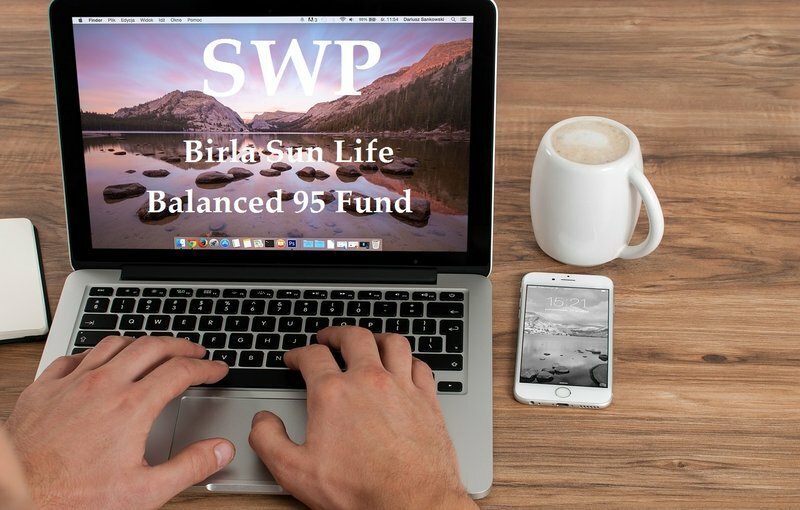 Birla Sun Life Balanced 95 Fund – Growth Plan has given excellent SWP returns in last 15 years and so and may be a good choice for investors looking for regular income from their lumpsum investments in balanced funds by taking only moderate risk. However, investors should note that past performance of mutual funds are no guarantees for future returns. Mutual fund investments are subject to market risk and therefore investors must consult their financial advisors and check if investment in Birla Sun Life Balanced 95 Fund is suited for their investment needs based on their risk profile.